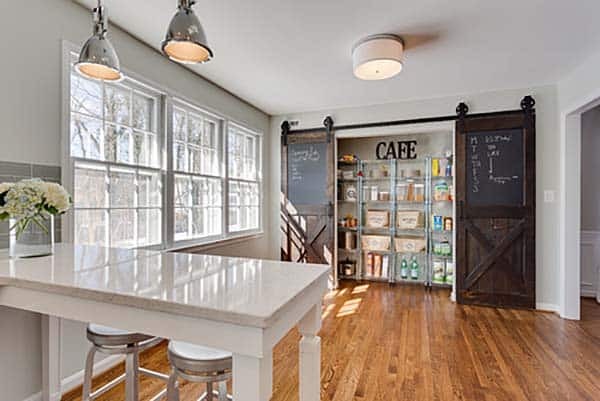 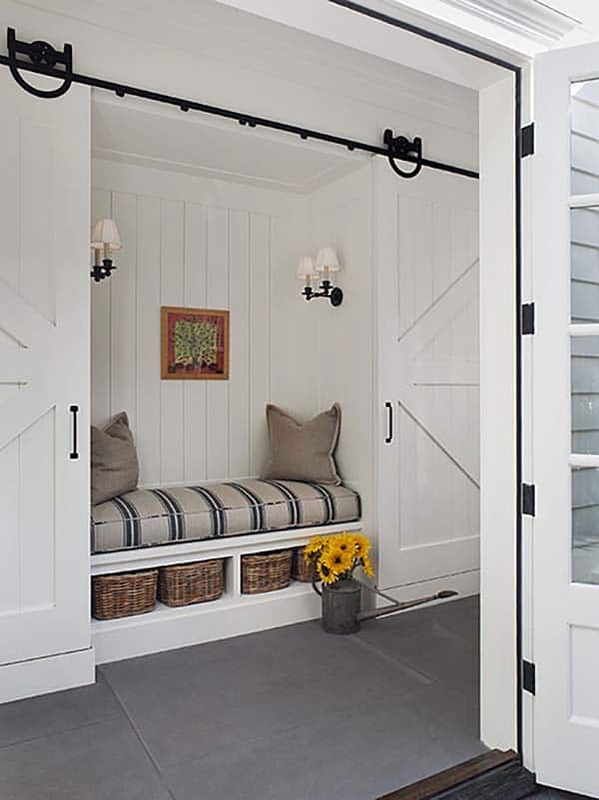 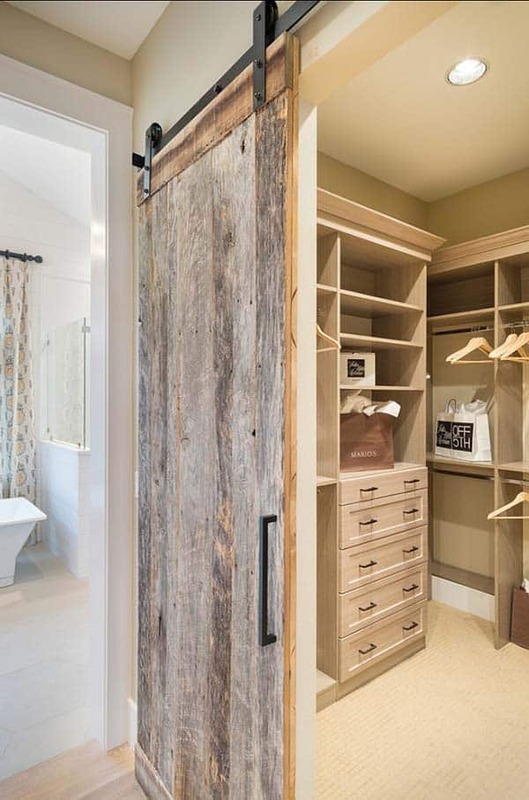 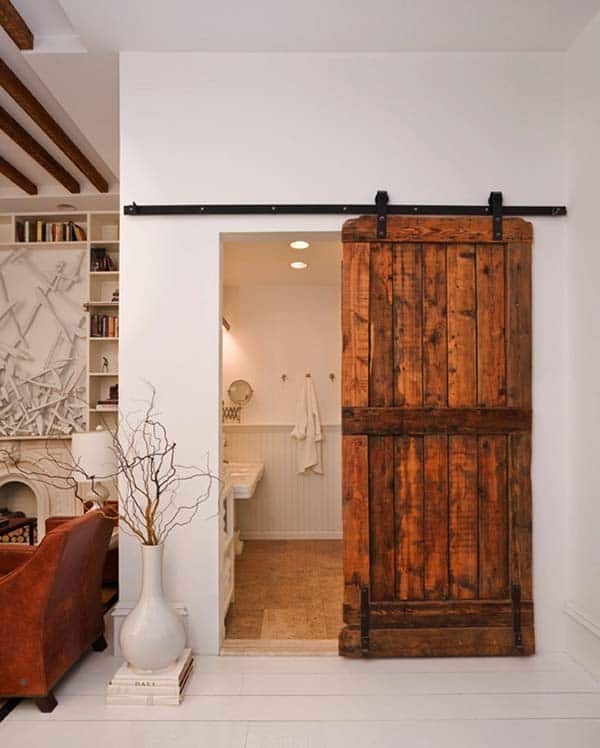 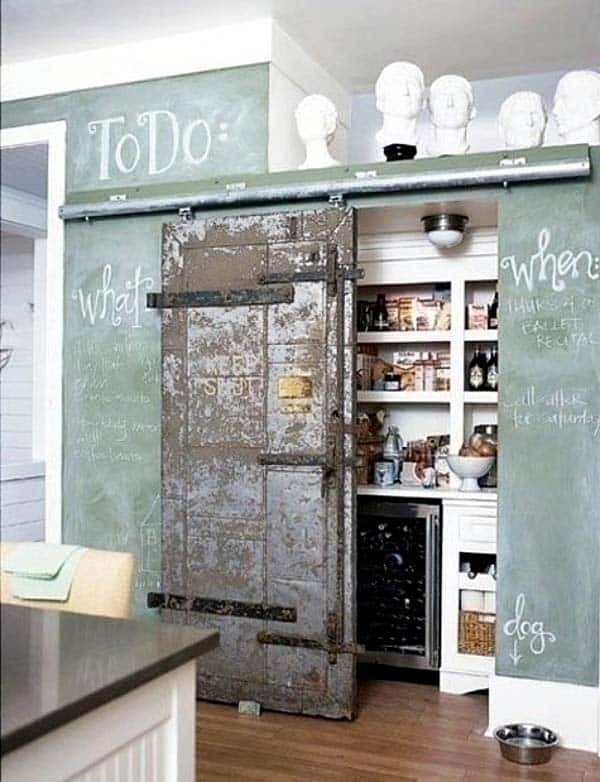 Whether you use sliding barn doors in your home as a space saving feature or just enjoy their delightful rustic aesthetic, there are many creative ideas for their use. 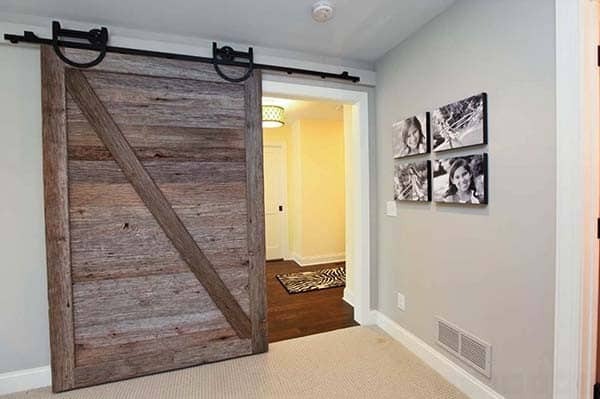 Using barn doors in your home can serve several purposes, whether you have a small space and want to create a more interesting design than a regular door or a pocket door, or you just want to make a visual statement. 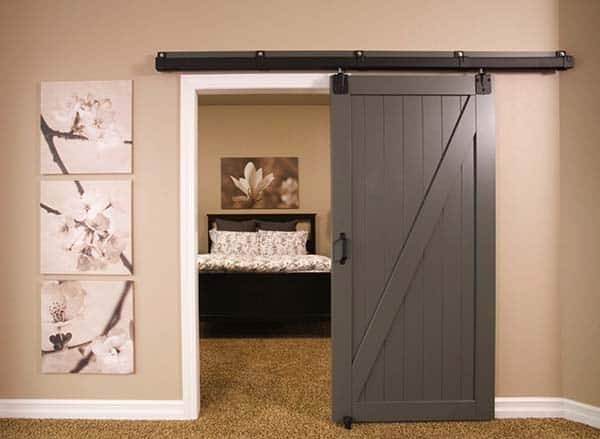 The downside to barn doors is that since they do not seal the same way that a regular door does, they may not help with sound attenuation, if that is something that is important for you. 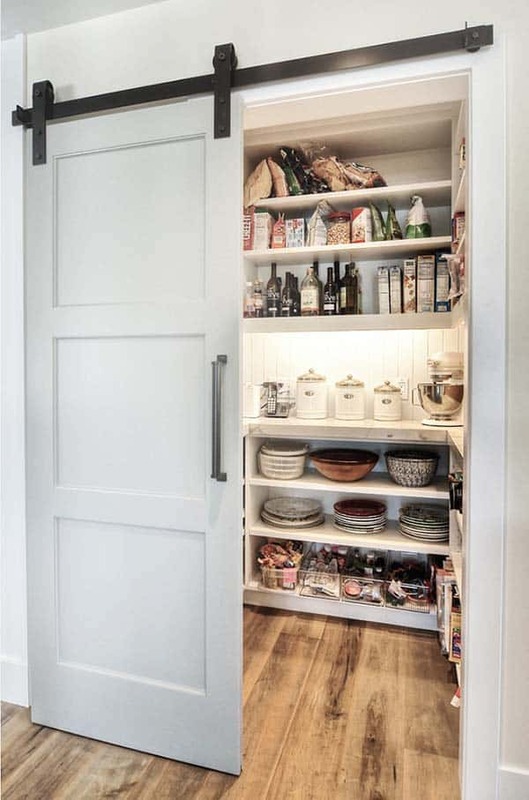 Obviously if it is a pantry door or closet door, this will probably not even be an issue to consider. 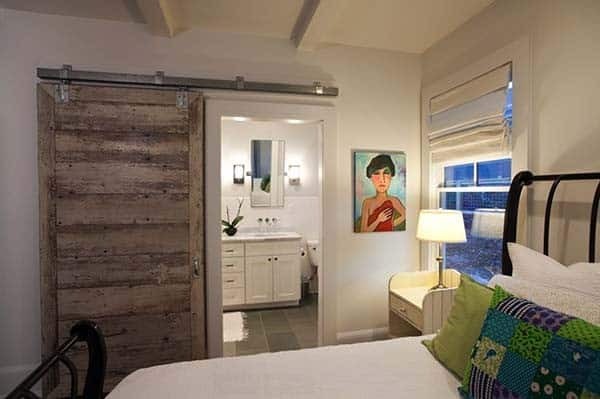 In the image above, if the designer had used a regular door, the whole design concept would have to be changed to make room for the door to swing in, which would have to leave about three feet of wall space. 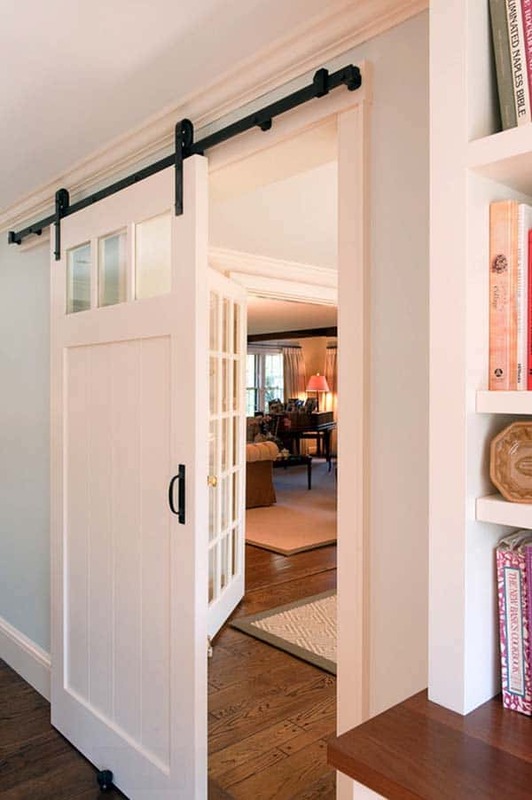 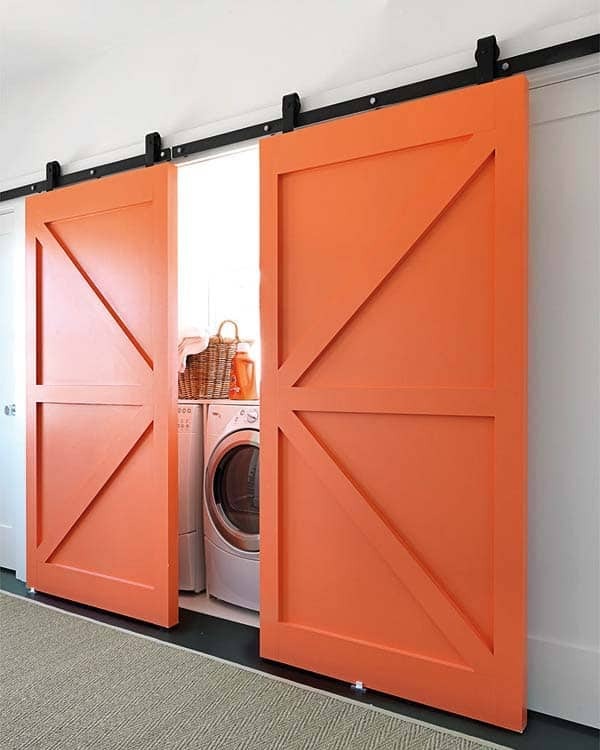 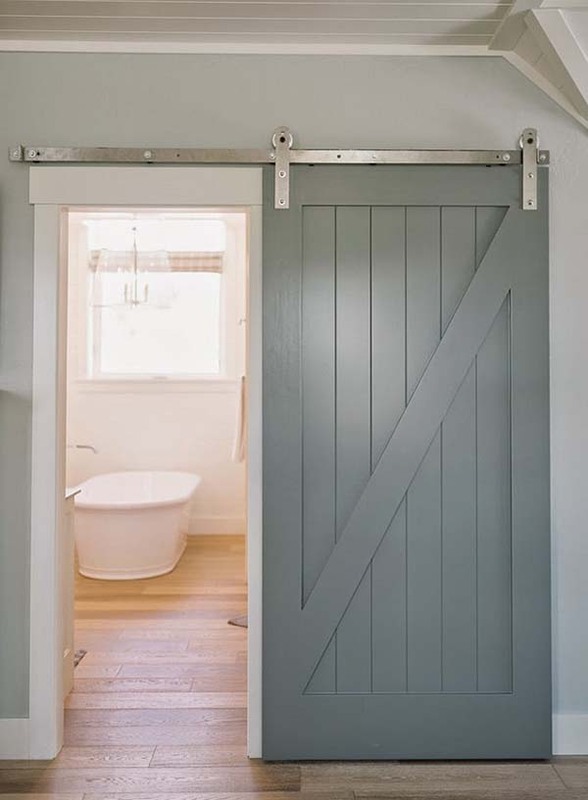 A barn door just requires a little DIY and some hardware to install, whereas a pocket door requires demolition to install, so the barn door option just got a little desirable. 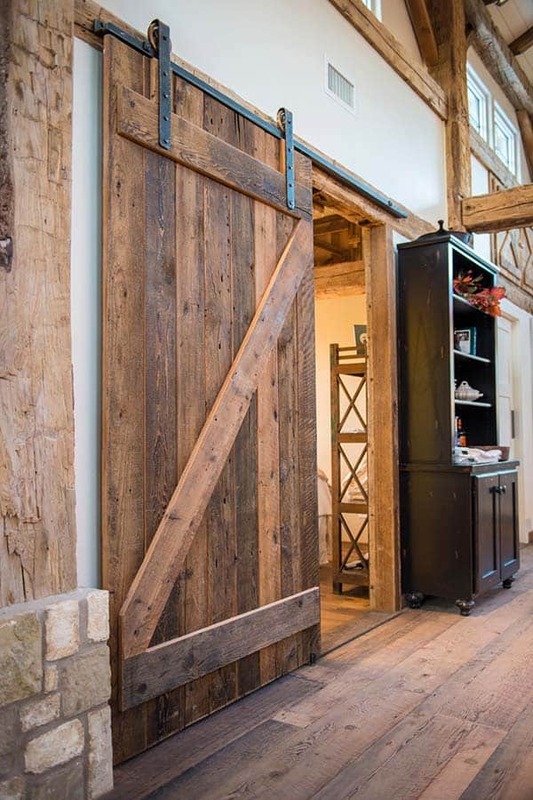 Barn doors can be used in any style of home, from modern to traditional, you just have to pick the right hardware and door style to fit with your design scheme. 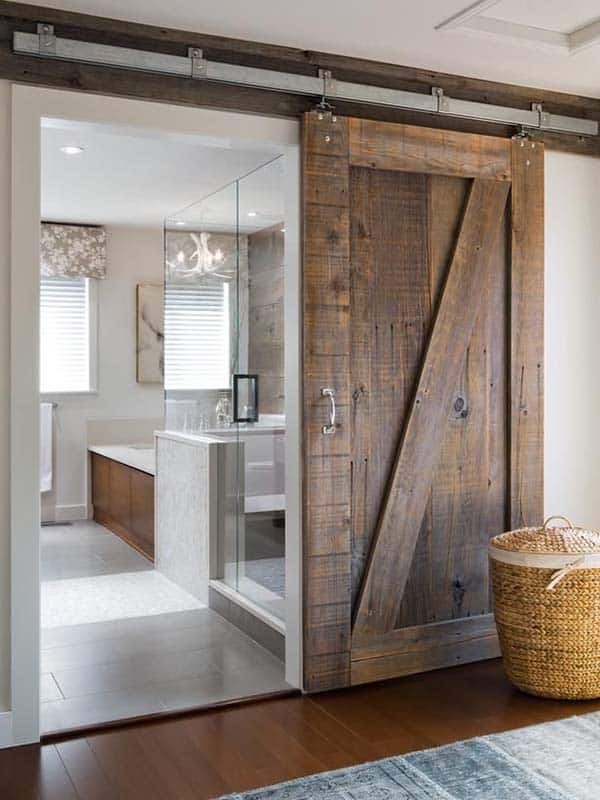 We have put together a collection of examples of using barn doors in your home in various ways to create a beautiful design aesthetic, have a look and enjoy! 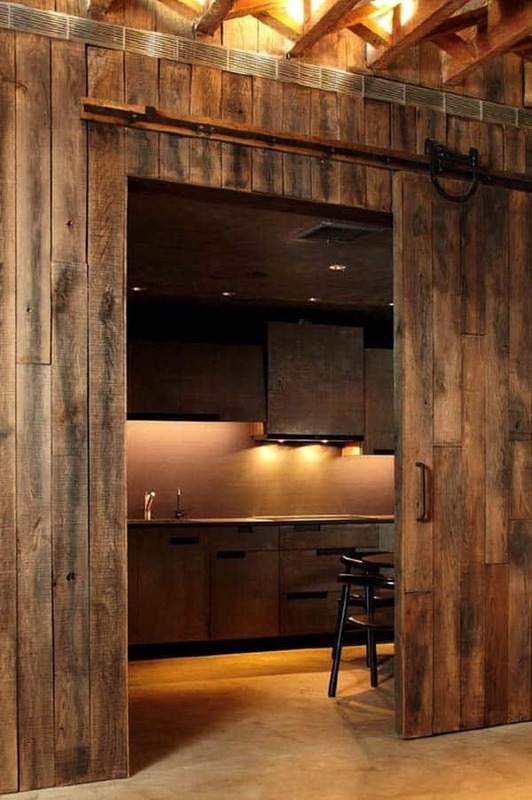 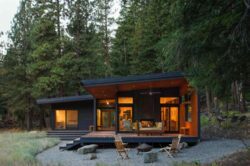 Want more inspiration, have a look at these: 53 Sensationally rustic kitchens in mountain homes and 55 Awe-inspiring rustic living room design ideas. 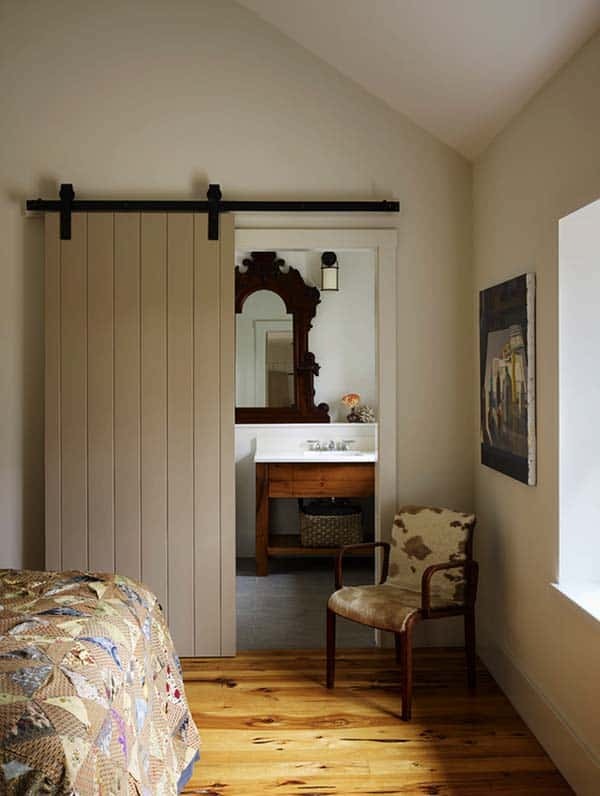 The sliding barn door that conceals this Mill Valley, California bedroom is painted white to blend in with its surroundings. 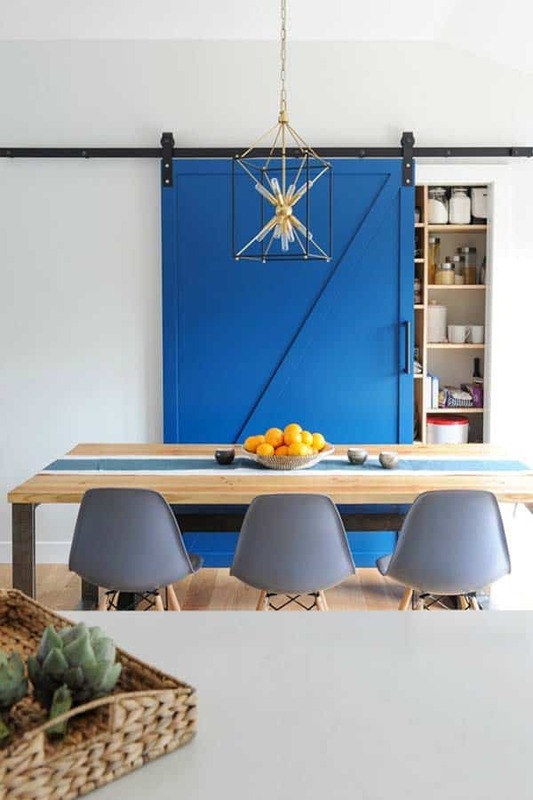 A sliding barn door in this entryway acts as a room divider but also adds visual interest upon entrance into the San Francisco, California home. 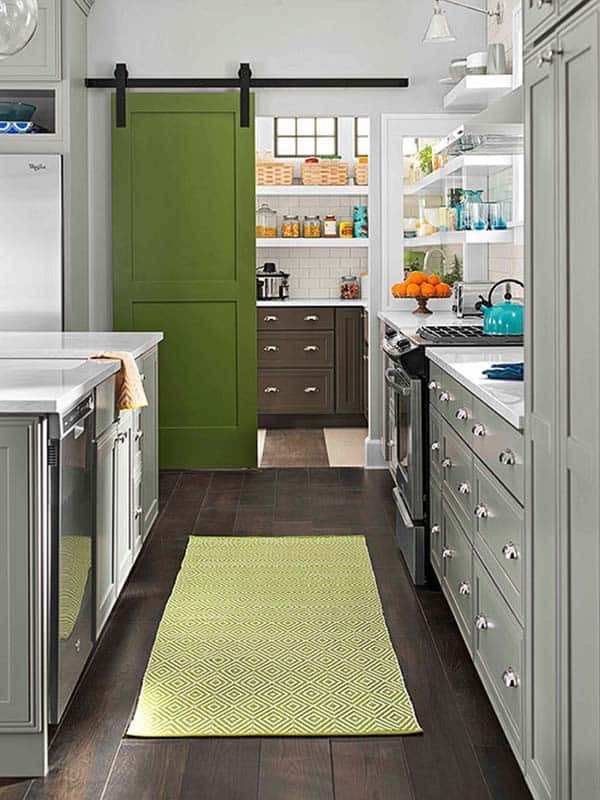 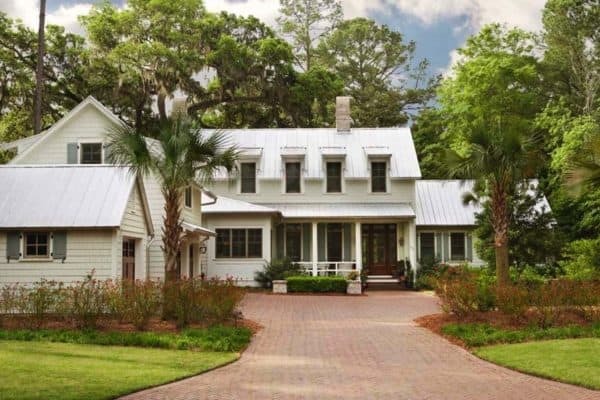 The brightly colored green door also adds visual appeal against the white walls. 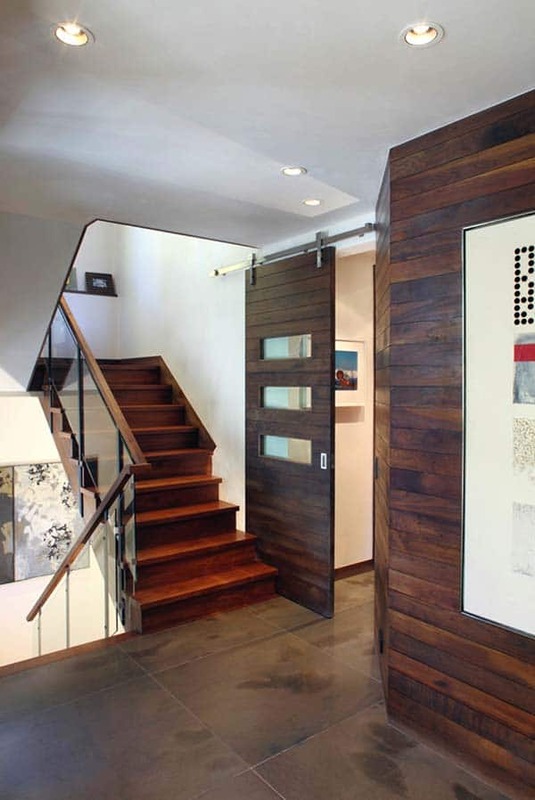 This sliding door in a contemporary Colorado home is a great space saver the way it slides cleverly into the adjacent staircase. 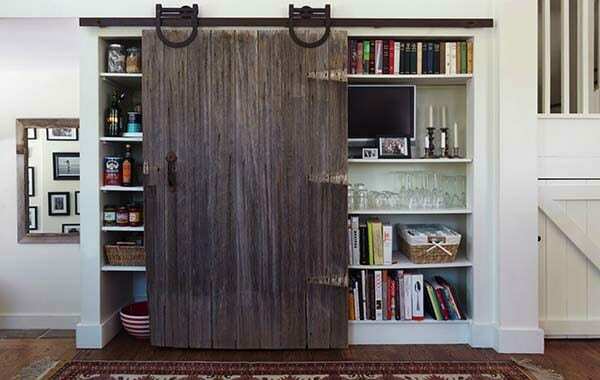 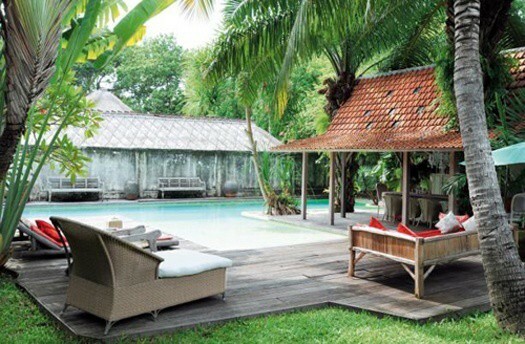 Clad in black walnut wood, it creates a seamless look when the door is closed. 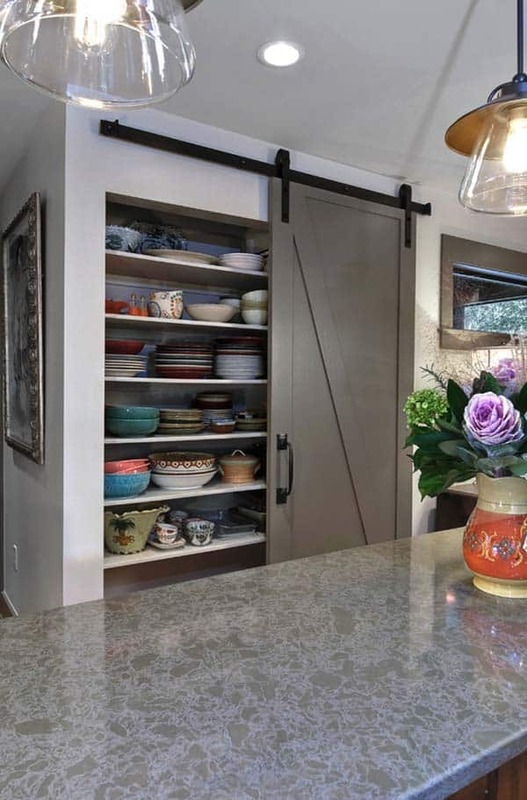 When space is at a premium in a kitchen, a custom barn door can slide open to reveal a hidden pantry and cover bookshelves that you would typically want to showcase. 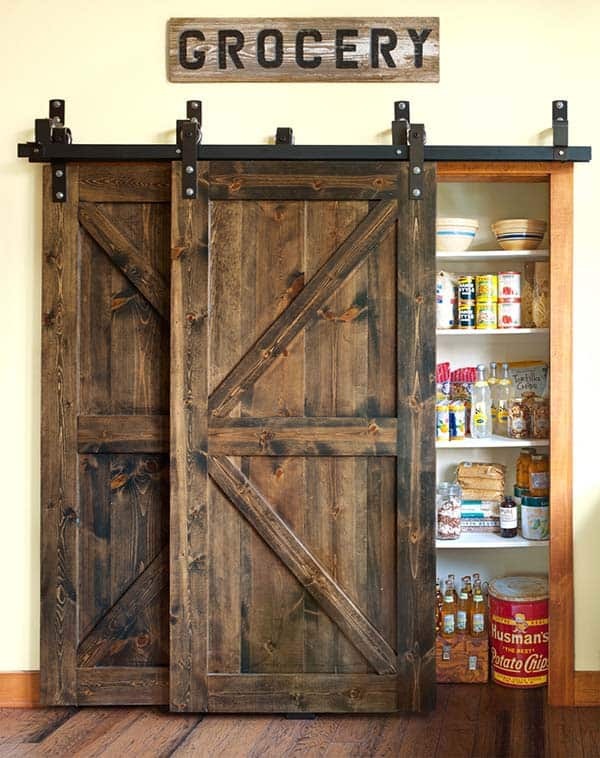 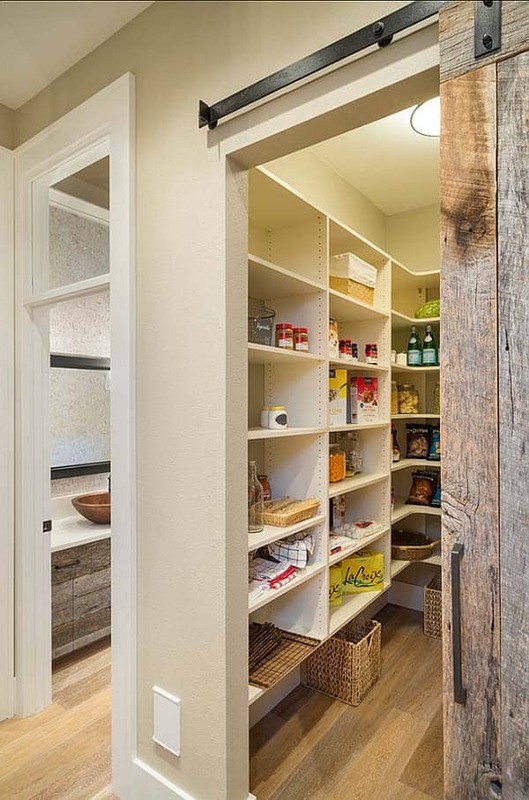 A stylish sliding barn door in this kitchen neatly conceals a walk-in pantry. 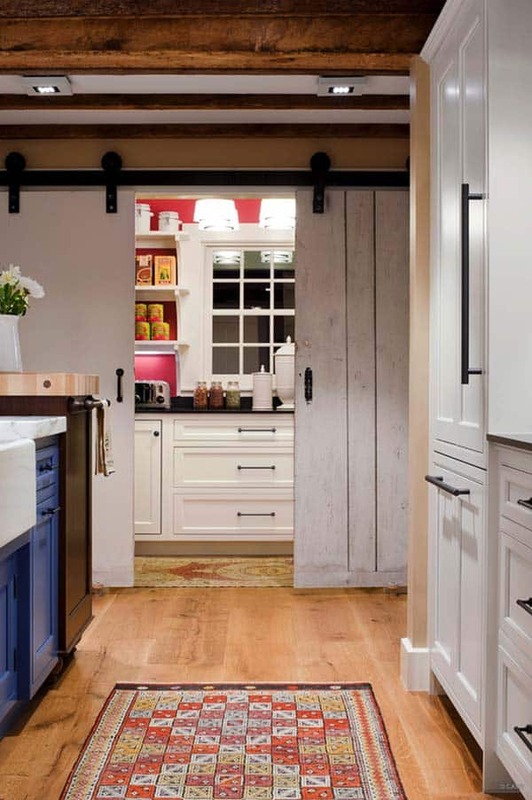 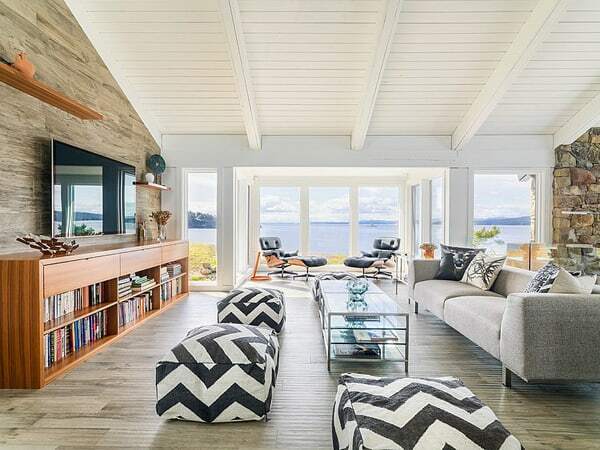 Wide plank flooring and colorful accents infuses warmth into the space. 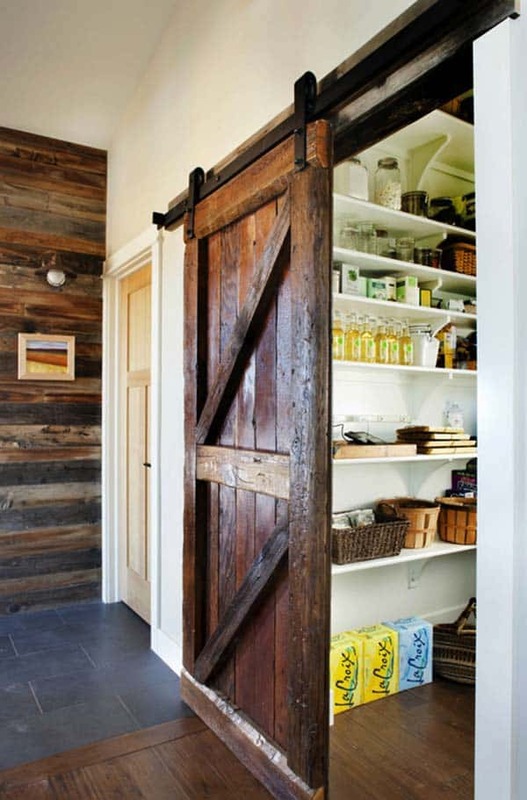 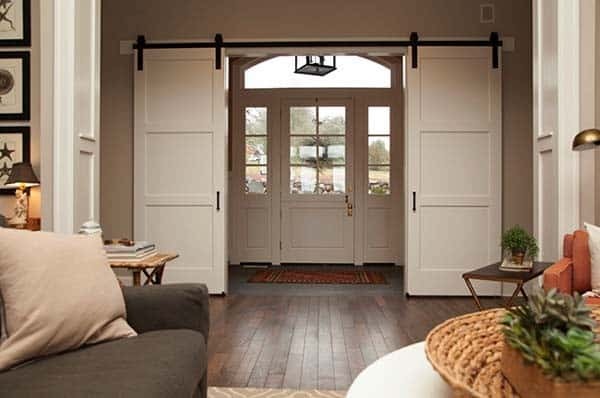 This Oregon home demonstrates a great example of using barn doors in an entry area. 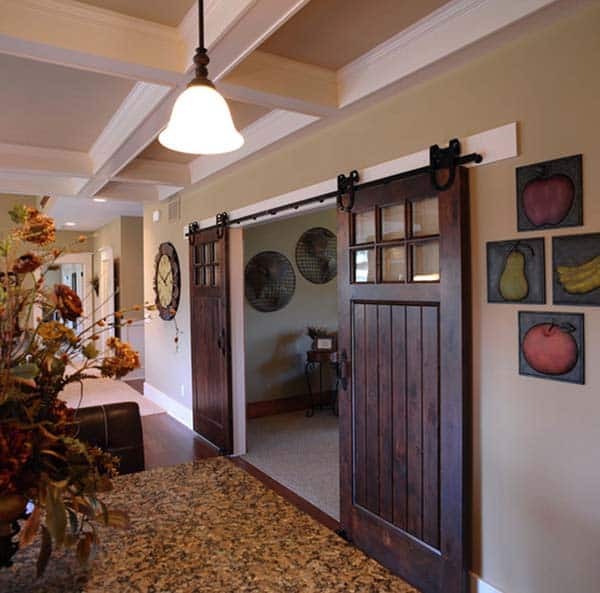 It breaks up the space between the entry and the great room to create a more formal entryway space for the homeowners. 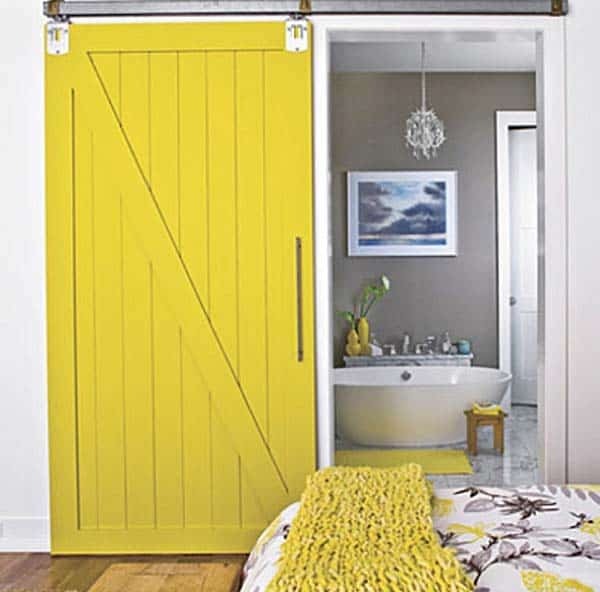 A barn door can add a burst of color into your space and offer a visual contrast of styles between industrial and a more soft and feminine appeal. 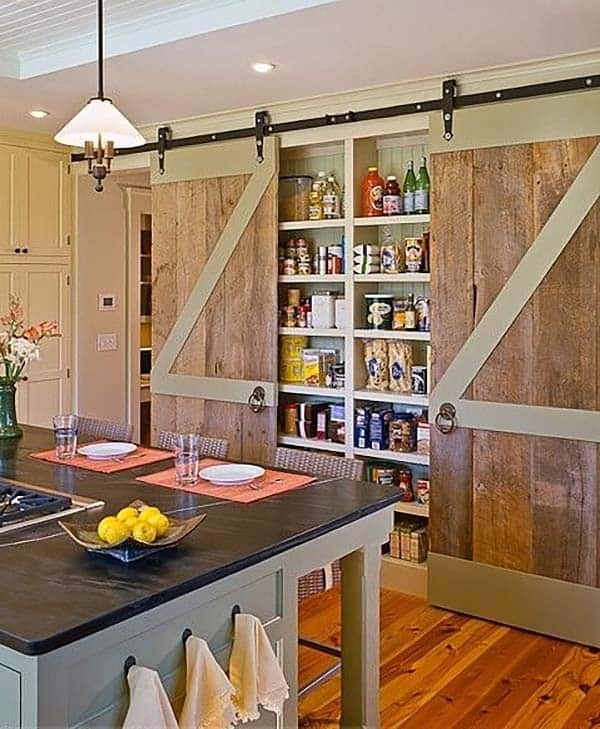 Not only are sliding barn doors beautiful to look at, but when used in a small space that can be very practical (and can be considered instead of a pocket door which isn’t nearly as attractive–as long as you have the wall space). 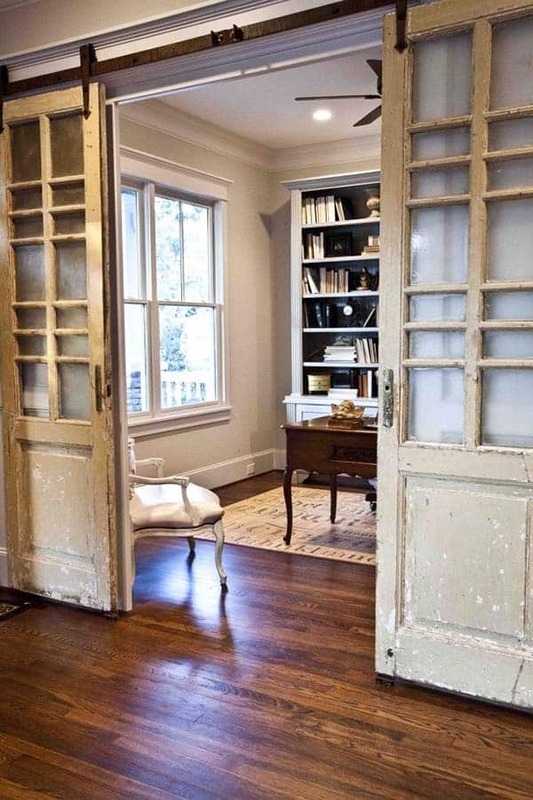 You can see how much space has been saved by not having a door that swings in. 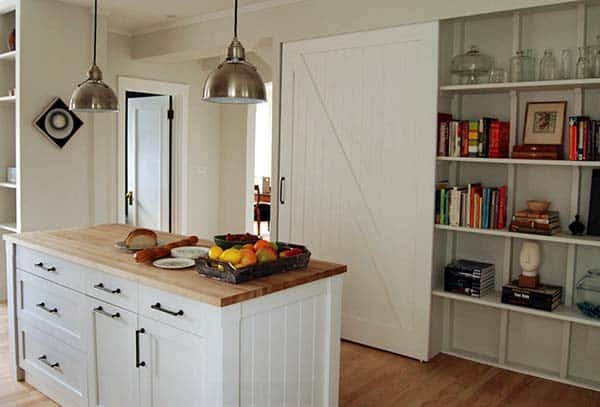 This entryway could have been left as just an opening, yet the addition of a sliding barn door adds beautiful visual interest to the space. 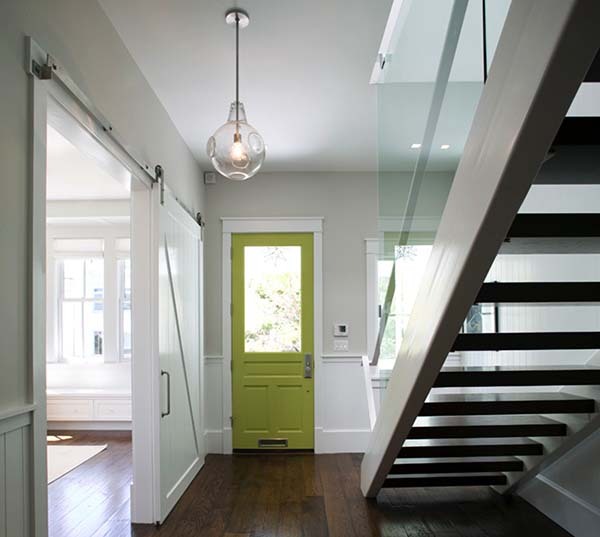 Panels of glass in the door lets light filter into the space when the door is shut. 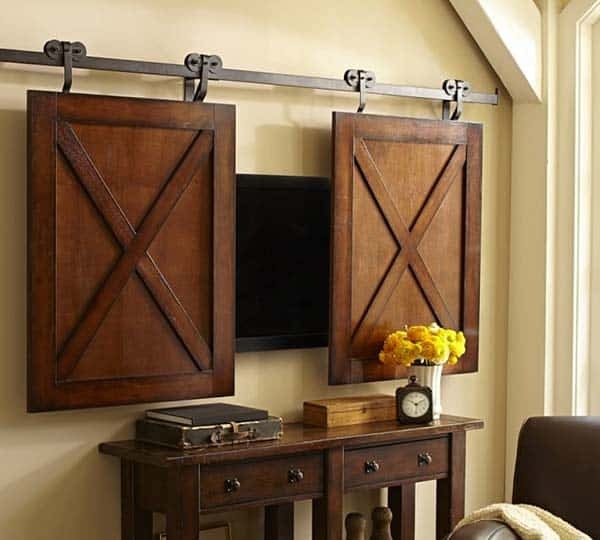 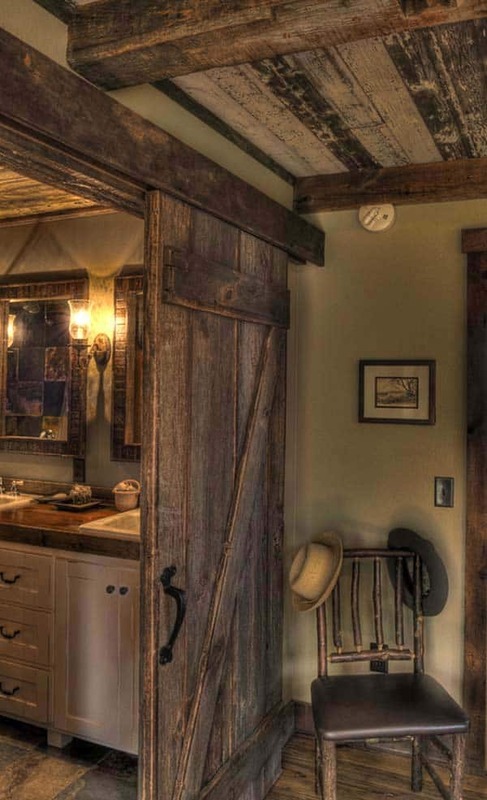 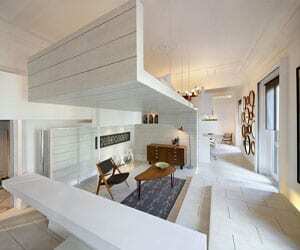 You can use barn doors on a track system like the image above to cleverly conceal a television out of view.